Poorboy's World Super Slick and Suds Car Wash is another shining example of Poorboy's ability to create a product that can compete with the best but at a reasonable price. Super Slick & Suds sure does live up to its name. One ounce in two gallons of water creates a bucket of never-ending scrubbing foam and highly effective wash water. Using the hose, a bit of water pressure will inspire and renew the cleaning bubbles throughout the entire wash. This very concentrated car wash is potent yet gentle when it comes to removing dirt, oil, road grit and grime. Modern technology has combined natural, gentle, effective cleaners to create a non-toxic, biodegradable, pH-balanced car wash concentrate. The cleaning principles have been combined with oils that encapsulate each dirt particle, eliminating the chance of swirl or scratch contamination. Although tough on dirt, Poorboy's Slick & Suds is gently on all surfaces, your skin, and the environment. This slick and sudsy formula will not strip or degrade any existing wax or paint protection. 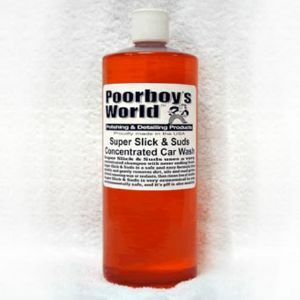 On the contrary, a renewed shine will emerge after each use of Slick & Suds Concentrated Car Wash.
Poorboy's World products are gaining popularity amongst amateur and professional detailers alike. Look at the results achieved with Poorboy's when compared with more expensive products on the market and see, or rather don't see, the difference!